For two years, we lived on Han Krum Street. Han Krum or Khan Krum is something like a founding father in Bulgaria. He led the First Bulgarian Empire at the turn of the ninth century and is probably best remembered for instituting the first written laws in his people’s history, mostly along the lines of no drinking, no stealing, and no lying. Like all good monarchs, Han Krum—aka Krum the Fearsome—vastly increased the territory over which he ruled. He defeated the Bulgarian arch nemesis the Byzantine Empire and made it as far north, east, and west as Hungary and Ukraine. He died before he could attempt taking Constantinople, though his preparations were apparently well underway. 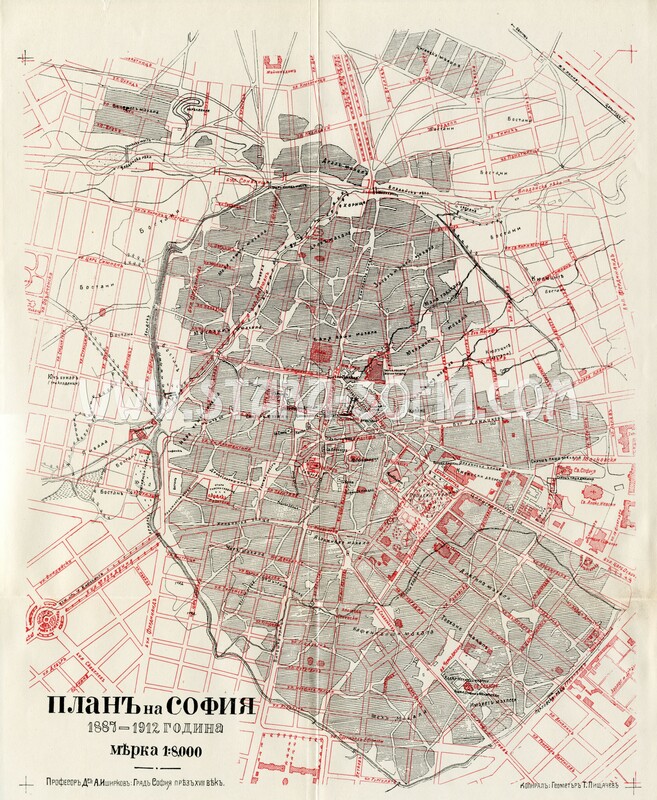 A map of Sofia marked “Plan of Sofia 1887-1912” shows the street with the name of “Tzar Krum,” but really the first Bulgarian leader with that title was Simeon the Great who won it after his own defeat of the Byzantines. It’s odd to see a map purporting to represent a city undergoing near constant change and development labeled as though frozen in time for 25 years. Actually many maps use the name Tzar Krum Street well into the 1930s and so do the engraved words in the wall at William Gladstone Street, Tzar Krum Street’s north terminus. Perhaps the Communists changed the name not for historical accuracy but instead to remove monarchical presence of every kind. Having ousted the royal family, the change of a street name was likely a simple matter. Sofia, like all cities, continues to change even as there are streets and buildings in the city center still recognizable from photographs a century old. Though car ownership has skyrocketed since the political changes of 1989, the garages that could be housing them have generally been converted to stores and offices and ateliers, perhaps nearly as many as those built specifically for those uses. All the garages of our small apartment block save one had been converted. One of these now serves as a плод и зеленчук (fruit and vegetable store). Tall and smiling black-haired Nellie presides. We talked almost daily. I would wait until there was a break in customer traffic. The store was so tiny this necessitated a delicate dance with the one or two other customers who might be positioned between the crates, peering closely at apples imported from Greece or which bunches of green onions appeared the freshest. We talked about Clinton (she didn’t like him, didn’t find him sincere) and Obama (she felt enthusiastic). We talked about Bulgaria’s endemic bureaucracy and endemic corruption and how those might be entwined. We talked about her husband who she always referred to as “the boy” and “the poor thing.” When I visited a couple of years after we moved back to DC, she told me Sasho had passed away the year after we left. Nellie has a round, childlike face and short-cropped hair only just beginning to show some flecks of white. She is younger than me, but she has a grandson just a few years younger than my son. Despite her daily, lonely grind, despite her sick husband, Nellie smiles a lot. Her eyes crinkle up, she laughs aloud, and she lets you know without actually saying it that the world was ever thus and ever will be so why complain. Her dog curls up on the floor. Her white van is parked out front, visible even in DC when I look the address up on GoogleMaps. Nellie introduced me to large, fresh, soft, candy-sweet dates imported from Iran. The dates are a bit expensive for many and she doesn’t have a big demand for them, but she would make sure to have a box or two on hand whenever I asked. In the winter, she and many market stands and small stores have vats of pickled vegetables, but you have to plan in advance and bring your own empty jars to fill. Sometimes I’d discover in the midst of cooking something that I was missing a key ingredient and was able to run downstairs, buy it, chat with Nellie, and return before the contents of the pot even started to simmer. My daughter took riding lessons when we lived on Han Krum Street and often went herself, quite early before her lesson, so that she could go into the barn and feed the horses, avoiding the small white one whose stall sign warned he was a biter. She made sure that she had some coins, asking Nellie en route which apple or carrot was the best for horses. Nellie agreeably advised for even this request of her fruit and vegetable expertise, “Пиленце (Peelentze), little chick, the horse will eat any one you choose,” holding in her laughter until reporting to me later.